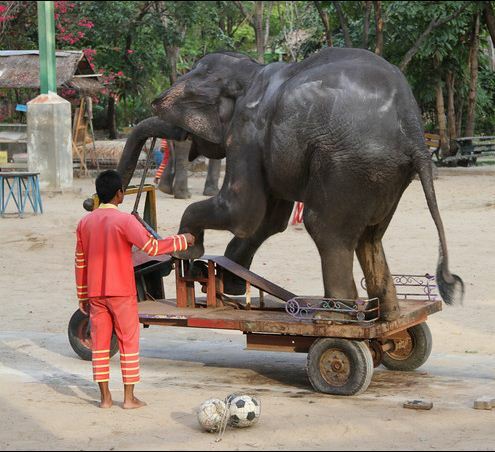 Shows, such as circuses or football games, are another distressing part of elephant tourism. 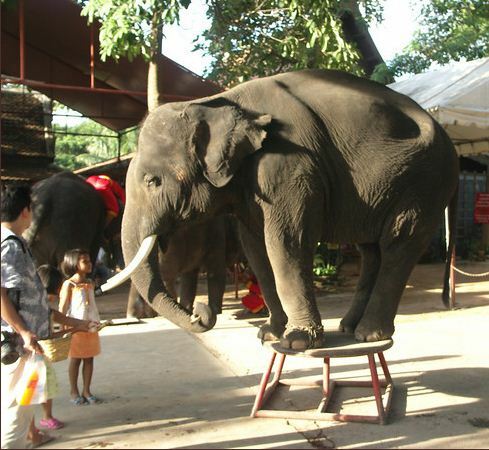 Once again, the elephants are kept in unnatural conditions. When not performing or rehearsing, they endure long hours in chains. Harsh and cruel training techniques are used to teach adults and babies their routines. 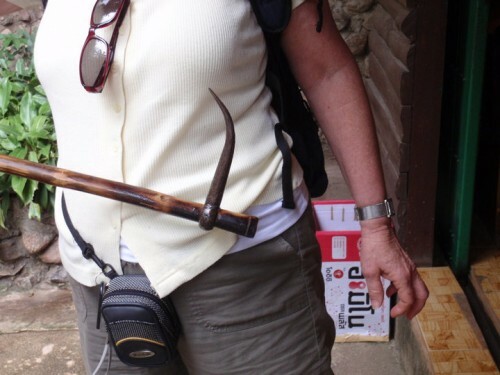 The use of whips, bullhooks, knives, and nails is common. 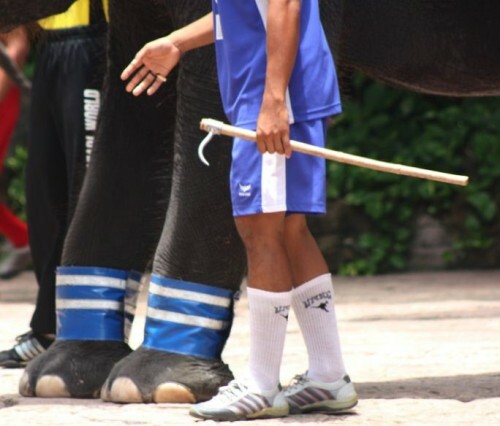 Most tourists are unaware of the damage and horrible treatment these elephants endure in order to provide entertainment. 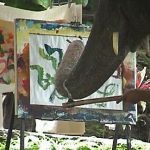 Elephant paintings are simple reproductions made by elephants. Tourists must beware of the commercial use of paintings. 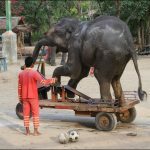 This alarming practice is becoming increasingly popular even outside Asia as orders are taken from overseas. 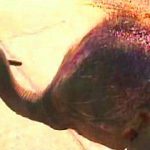 Tourists drawn to elephant ‘camps’ often find young elephants forced to paint. Harsh methods are employed to make them learn to hold a paint brush and execute specific strokes on a canvas. 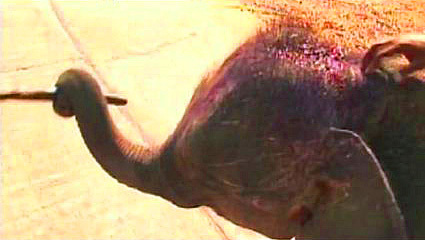 In order to program the direction, a knife or nail is sunk into the flesh of the sensitive trunk. 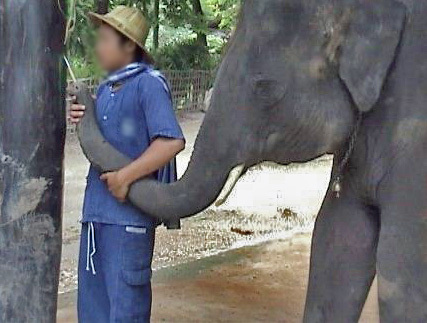 Learning these tedious tasks leaves the elephants scarred and emotionally exhausted. These paintings are NOT art. Art requires self expression. 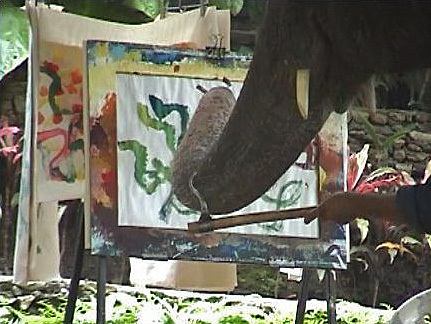 The elephant is merely reproducing the same painting over and over while directed by the handler. If you are in search of entertainment, enjoy a cultural exhibit or dance show. If art is your passion, support local communities by buying local art. 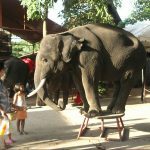 Tell everyone you know not to see an elephant show or buy an elephant painting.